UMass, UMD to Meet for Title - College Hockey, Inc.
Minutemen and Bulldogs set up showdown Saturday night. Minnesota Duluth celebrates the first of Justin Richards’s two goals Thursday night (Photo by Matt Dewkett). A newcomer will attempt to dethrone the defending champions in Saturday’s national championship game after Massachusetts and Minnesota Duluth won their semifinals Thursday night at Buffalo’s KeyBank Center. Saturday’s championship game faces off at 8 p.m. ET and will be televised on ESPN2 and TSN2. Massachusetts advanced by beating Denver, 4-3 in overtime, while Minnesota Duluth topped Providence, 4-1. 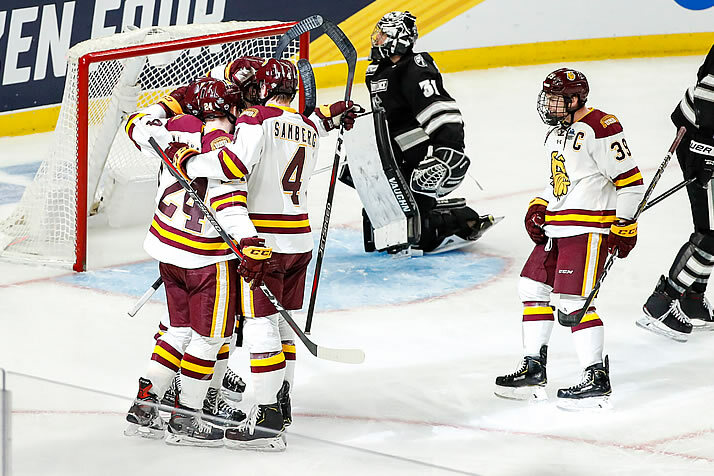 Minnesota Duluth returns for its third straight national championship game appearance thanks to its victory against Providence, which included two empty-net goals. It marks the sixth straight NCAA Tournament game that the Bulldogs have won 2-1 plus empty netters. The Bulldogs are the first team to play in three straight national championship games since Boston College from 2006-08. They will seek to become the first repeat champions since Denver in 2004 and ’05. UMD and Providence entered their third period tied, 1-1, before Billy Exell scored the eventual winner for the Bulldogs at 10:07 of the third. That came shortly after UMD had killed a five-on-three Friars power play in a key turning point. Dylan Samberg and Justin Richards added empty-net goals to cap the Bulldog win. Hunter Shepard made 28 saves to earn the victory. Marc Del Gaizo’s goal 15:18 into overtime lifted Massachusetts into its first national championship game. The Minutemen jumped to a 3-1 lead in a penalty-filled first period that saw all four goals scored on the power play. After Denver scored first, Bobby Trivigno, Mitchell Chaffee and John Leonard answered to give UMass a first-intermission lead. After a scoreless second, Denver stormed back in the third. Freshman Cole Guttman scored twice in less than six minutes, tying the score with just 3:46 remaining in regulation. Both teams had chances in overtime but Massachusetts held a 7-5 shot advantage. The winner came when Oliver Chau passed it back to Del Gaizo for a one-timer through traffic.